Discussion in 'Mapping Questions & Discussion' started by Blinx, May 19, 2016. 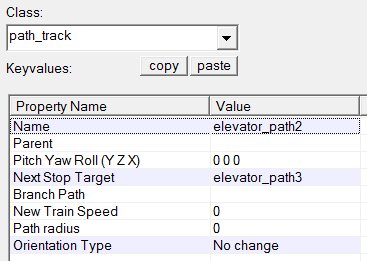 I'm creating an elevator with func_tracktrain and 3 path_tracks, but no matter what I do, my elevator spawns sideways, and stays that way. According to the VDC, using the orientationtype "Never": "The orientation of the train is fixed (instead of being relative to the direction of the track) permanently facing the direction it was spawned in (according to the direction of the first track). 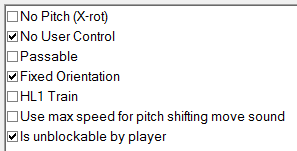 This overrides the Orientation Type settings of its path_track. Does not turn around when reversing direction. 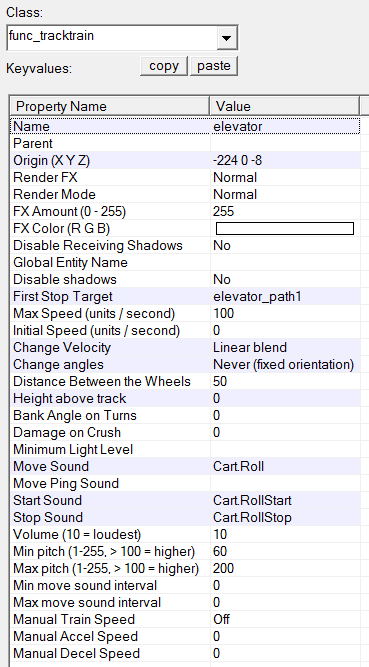 ", but I can't find for the life of me what value the train uses from the path_track to get this value, because it isn't it's pitch, yaw or roll, I've tried changing those to bizarre values to try and get a bizarre result but it's still just sideways. 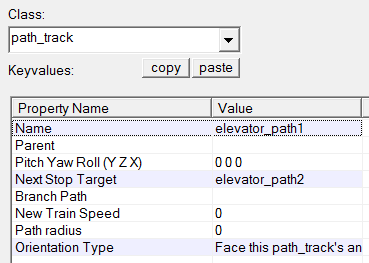 Thusly, I'm lead to believe that whatever value the train tries to get from the first path isn't exposed as an option, anyone else messed with func_tracktrains and path_track shed any light on this? Because I'm just stumped. Did you build it facing the to the right in Hammer? It's the same thing with payloads and trains, where you have to place them facing east (to the right) otherwise they'll spawn at a weird angle that you can't fix via I/O. The "train" in this case is brush based, so does it really have a facing direction? I didn't think to check the flags, that seems to have fixed it, thanks for that.